Are People in Your Occupation Sleep-Deprived? Some people dream of doing great things, and others stay awake and accomplish them. This motivational statement reflects the widely held notion that working hard – even when it comes at the price of sleeping well – is a virtue to which we should all aspire. In reality, sleep is of vital importance to our well-being. Numerous studies have shown that the well-rested are also the happiest and most productive among us. We decided to investigate which groups of American workers got the most and least sleep. Then we delved deeper, comparing our findings to workers’ statements about their mood, exploring the sleep habits of working men and women, and looking at which occupations take sleep-aid medications most often. 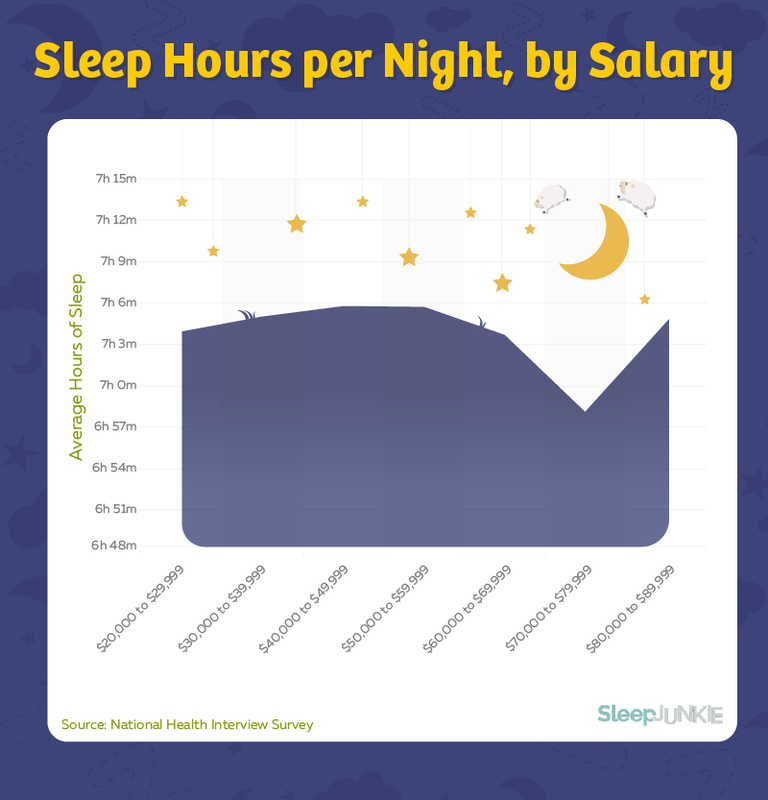 We even correlated the number of hours that people sleep according to their salaries. All of our findings are based on the National Health Interview Survey conducted by the Centers for Disease Control and Prevention. Here’s what we discovered. According to the National Sleep Foundation, most adults require between seven and nine hours of sleep per night. More specifically, adults between the ages of 18 and 64 need seven to nine hours of shut-eye. Older adults (age 65 and over) can do with an hour less – seven to eight hours of sleep each night. How much sleep do many adults get? 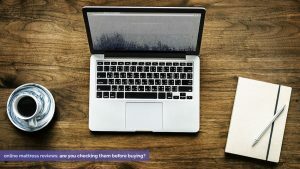 The answer is less, especially for those in the workforce who must divide their time between meeting the demands of their industry and doing the many things that make life at home productive and – hopefully – enjoyable. Who sleeps the least? 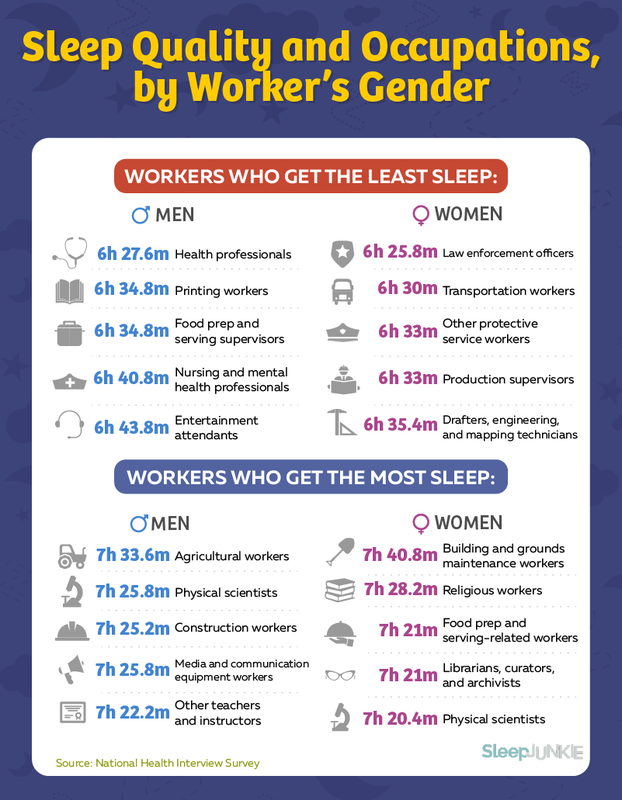 Our analysis shows that several diverse occupations, including food processors, firefighters, nurses, and extraction workers, all get less than the recommended minimum of seven hours of sleep per 24-hour period. There is only an 18-minute difference in sleep time between the most- and the least-deprived workers. As one might expect, the occupations identified on the chart sometimes demand workers be available during all hours of the day – and night. It’s disconcerting that many of these demanding occupations, such as firefighting and nursing, also perform important duties related to saving lives. Still, disrupted sleep is sometimes unavoidable – which can be just as bad for your health as not sleeping at all. It’s widely known that engaging in physical activity promotes sleep. This is why many poor sleepers are advised to add exercise to their daily health care routine or to ramp up the amount of exercise they already get. It makes sense, then, that of the occupations we looked at, those that include physical activity tend to get the most hours of sleep. 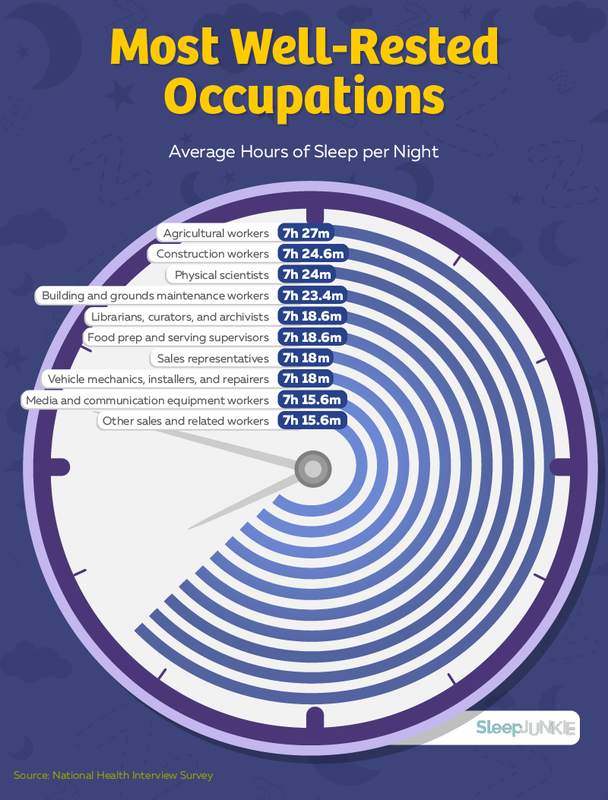 Among the longest sleepers are those who do agricultural, construction, and groundskeeping work, which are all typically physically demanding. Other people who tend to sleep well include academics, such as physical scientists and librarians, as well as people in industries that operate on a 9-to-5 schedule, like sales representatives, mechanics, and media and communication equipment workers. 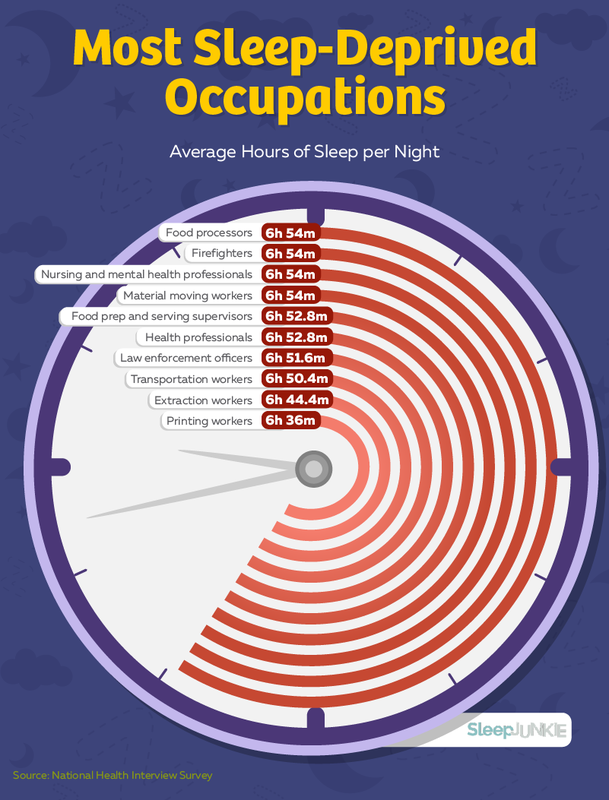 We found just a small difference in these occupations’ overall average sleep times, which ranged from a maximum of seven hours and 27 minutes to a minimum of seven hours and 16 minutes. Young people considering the line of work they want to go into may wish to consider not only the job description but also the potential for sleep quality. 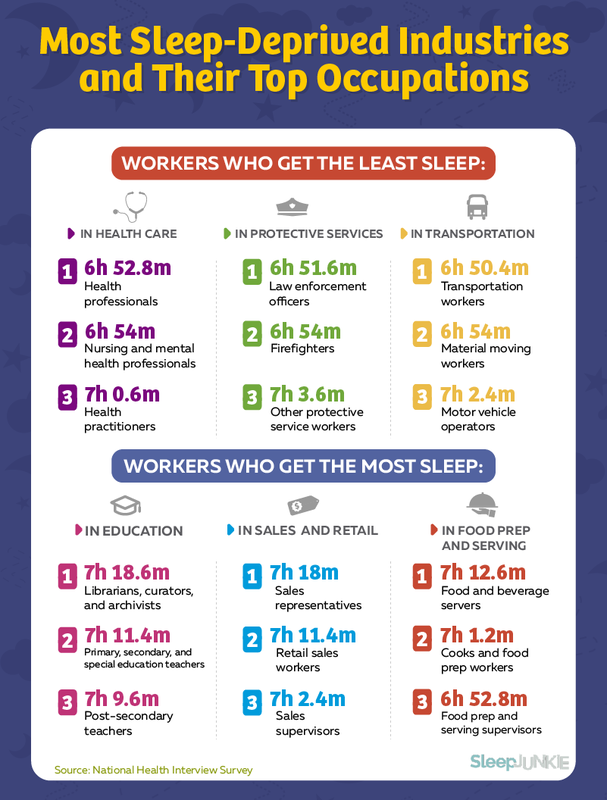 Education, sales, and food preparation and serving appear to correlate with workers sleeping the longest hours, while fields such as transportation, protective services, and health care seem to correspond with the fewest number of hours slept. That said, many factors within the workplace have to be considered when it comes to overall sleep quality. For example, just having autonomy at work (that is, being able to make decisions about how the work will get done) has been shown to impact sleep in a positive way. This suggests that when our minds are actively engaged during the day, we can fall into deeper and more restorative sleep at night. Who sleeps better? Men or women? The answer to this question is not nearly as straightforward as we might expect. What researchers do know is that men and women sleep differently. It’s been asserted that women need an average 20 minutes more sleep per night than men because they use their brains more during the day to do things like multitask. The data we analyzed showed that, for women, having a job in law enforcement translated into sleeping, on average, just about six hours and 26 minutes per night. Considering that sleep experts recommend adults get seven hours of sleep per night at minimum, this statistic is certainly a cause for concern. Being a female groundskeeper, however, is apparently great for sleep. This group of workers averages about seven hours and 41 minutes of sleep per night. In addition to the physical exercise that groundskeepers get during their workday, they are also outdoors and in the natural sunlight much of the time, which has been shown to drive our circadian rhythms and positively impact sleep quality. For men, being a health professional (working indoors and likely under artificial light) affords the least sleep. Male agricultural workers sleep most, once again pointing to the benefits of doing something that is both physical and takes place in the sunshine. 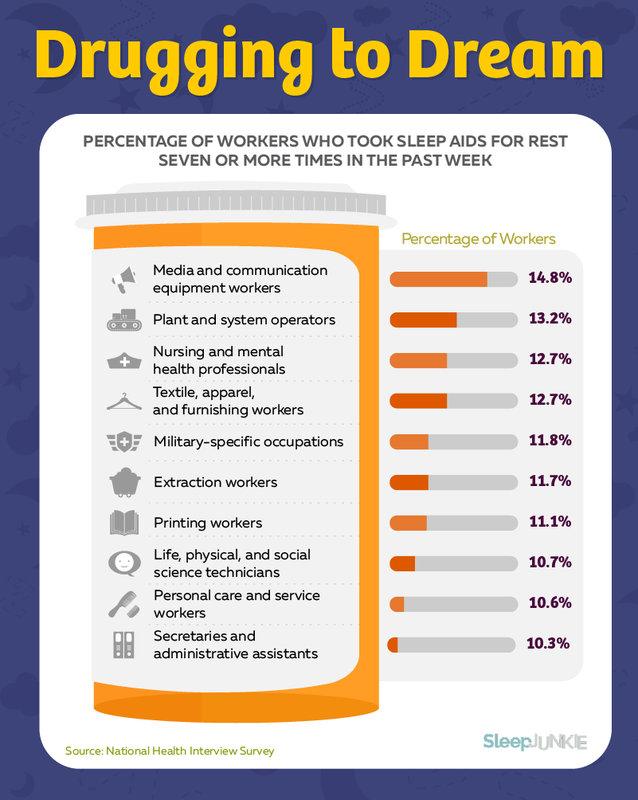 Workers in some of the occupations we looked at were particularly inclined to take sleep aids multiple times throughout the week. 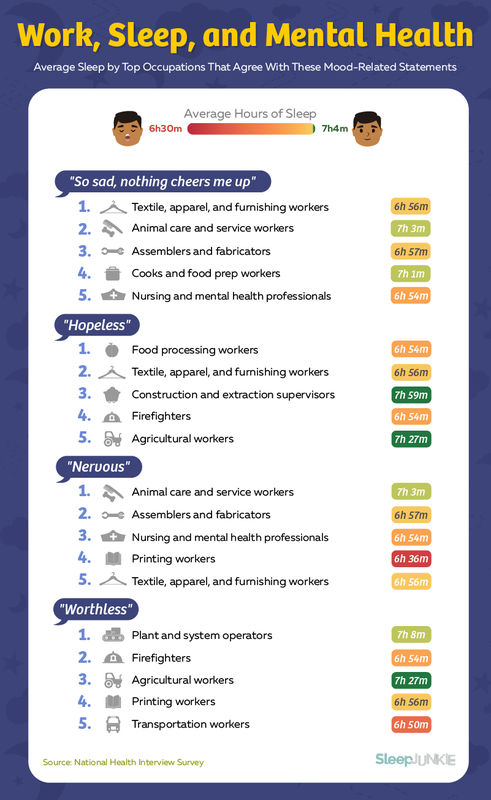 Nurses and mental health professionals were among those at the top of our list, perhaps because caring for others on a regular basis leaves them sleepless at night. At the very top of the list, however, are media and communication equipment workers. This field is devoted to assuring that audio and visual equipment runs smoothly. People in this arena may engage in a variety of tasks, from operating cameras and lighting equipment to editing videos and setting up special effects. It’s anyone’s guess as to why workers in this relatively narrow and technical field are taking so many sleep aids (nearly 15 percent of these workers take them seven times or more per week). 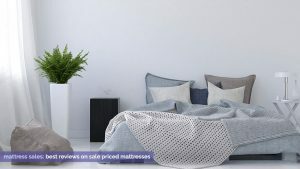 An alternative to taking sleep aids is to make lifestyle changes that include ramping up exercise and – for example – using all five senses to create an environment that is conducive to sleeping well. We next examined statements that workers in various occupations made about their overall mood and the amount of sleep they get on average. The results of our analysis are striking. Workers in fields that tended to get the least amount of sleep often expressed feelings associated with sadness, depression, and anxiety. Printing workers (who got the least sleep of all) said they were “nervous;” firefighters said they were “hopeless;” and nurses and mental health professionals said they were “so sad” that nothing cheered them up. Could a lack of sleep be impacting these workers’ moods? Probably. Poor sleep has been linked to everything from irritability to depression. At the same time, it’s important to note that correlation doesn’t necessarily translate into causality. In other words, it’s possible that these workers are sleeping poorly because of their poor emotional states or for some other reason. Do those who are better off economically sleep longer at night? Conventional wisdom might say yes, but according to our analysis, the answer is no. People earning as little as $20,000 per year and as much as $90,000 annually slept for roughly the same number of hours pretty much across the board – with one notable exception. Between $60,000 and $90,000 of annual income, there was a dip in the number of hours slept, with the low point for sleep being between $70,000 and $80,000. It could be that people in this salary range are burning the midnight oil in an attempt to advance their careers. It’s also possible this salary range just happens to encompass the most number of workers who get the least amount of sleep. Whatever field you’re in, one thing is clear: Falling asleep, staying asleep, and getting enough sleep is crucial to your overall physical and emotional health. But there’s a science to reaching bedtime bliss. Truly restful Zzzs are tough to come by in this gadget- and goal-driven economy. That’s why Sleep Junkie does the experimenting for you. Sure, it’s a hard task – testing all those soft pillows and the best beds available – but we enjoy it. Sleep Junkie has you covered with the latest on products and information that bring you better rest and thus, better work and overall health. We looked at data from the CDC’s most recent National Health Interview Survey, specifically the Sample Adult file, for questions related to sleep, occupation, and health. For salary information, we referenced the most recent median earnings by occupation from the U.S. Census Bureau’s American Community Survey. The NHIS uses different occupation codes for its detailed occupations than the ACS, so we looked at the ACS’s figures for simple occupations.